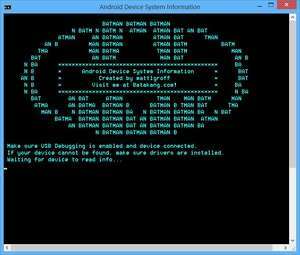 Android Device System Information is a small command line utility which displays information about your Android device, whether it be tablet or phone. It's a command line utility that comes with ADB which connects to your device, but USB debugging must be enabled and access to the device must be granted in Android. Android Device System Information displays the root status of the phone, charge status, charger health, battery type and system uptime. For security reasons, you should also check out the Android Device System Information download at LO4D.com which includes virus and malware tests. Additional screenshots of this application download may be available, too.